It was a routine weekend and I was busy with summer cleaning. While doing that, I observed that old clothes are taking up all the space which I could be using for clothing that I actually wear. Old T-shirts, shorts, jeans, kids’ clothing, old sweaters…my God! I’ve thought of tossing them out or giving them away, but lacked the motivation to actually do it. So for a change, I thought why not recycle them in a creative way and make some super easy recycling products by using old clothes? I am sure you also have plenty of old clothes in your closet. Here is a simple craft guide to make some fun and easy recycled products from old clothes. When trash gets converted into treasure with our effort and hard work, it gives a true sense of joy and satisfaction. For a great end result, it is essential to do some preparation and proper research. Here are some handy tips to keep in mind before starting your cloth recycling projects. 1. Sorting: When we see lots of different types of old clothing in a closet, it creates a sort of tension and confusion. So the first step to making your task easier is to sort and rearrange clothes according to their category. It is best to put the different types of clothes in a recycle bin or labelled bag to make further work easier. 2. Pay enough attention to texture and pattern of old clothes: Crafting is an art that requires minute observation and creative skill. Whenever you select a theme for a craft project it is essential to pay enough attention to the texture and pattern of the basic craft material. 3. In-depth research: It is always advisable to do an in-depth research from various sources (Internet and books are great options) to optimize the chances of a better result and an awesome end product. Gather the available home decorating material: Crafting may become an expensive hobby if we start buying all craft supplies. It is best to gather decorative material available at home (beads, old accessories, fabric laces are the wonderful option for that). 4. Involve your kids: Even if you are doing a sewing or home decorating craft project, involve your kids in that project. Assign them simple tasks like gathering the decorative material or take their help in gluing and other simple steps. Crafting, and especially recycled crafts are the easiest way to teach them the importance of recycling and reusing the waste product. 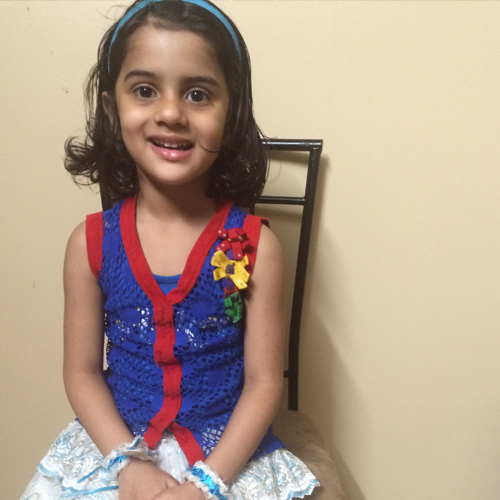 It is also helpful in developing creativity and imagination power in kids. After doing proper research, we selected these five super easy clothes recycling project. It is the most simple but attractive way to recycle an old T-shirt. It can be done by sewing or no sewing method. We did it with the sewing method. First, put the T-shirt on the pillow for proper measurement and cut all the excess parts accordingly. Then sew it with an opening on the upper side. 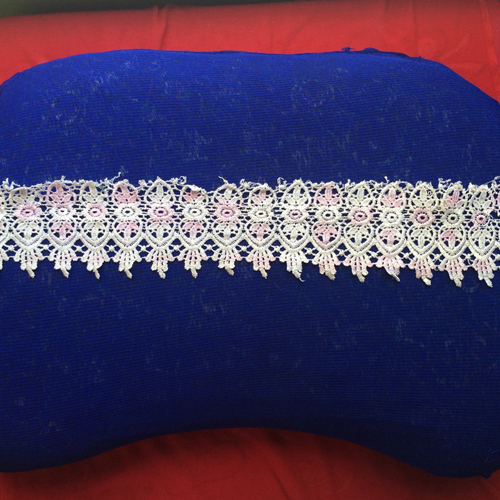 Decorate with old fabric lace or other decorative material. Your beautiful pillow cover is ready. Sometimes, we have some favourite T-shirts with memories attached to them (especially in kids’ T-shirts). This is an ideal way to preserve your memories for the future. It is the second most interesting but elegant cloth recycling project, which we enjoyed so much. 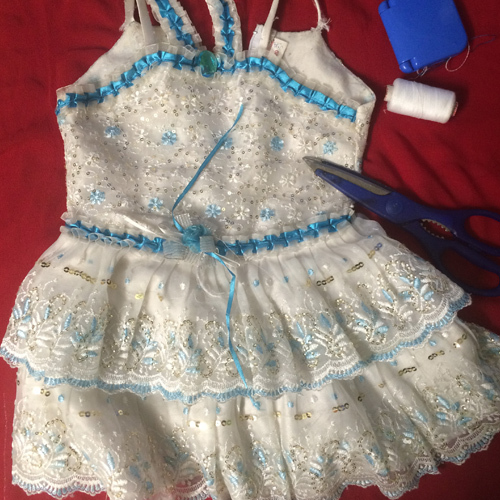 I had plenty of beautiful baby frocks in my closet (and I want to keep them, because of some sweet memories) and my 4-year daughter just loved tutus, so I thought why not make a tutu from this baby frock. It requires a little alteration and your job is done. First cut the upper portion of the frock after proper measurement, then put an elastic band or fancy belt in the waist. Your cute adorable tutu is ready to wear. The kids were curiously waiting for the end result of this project. 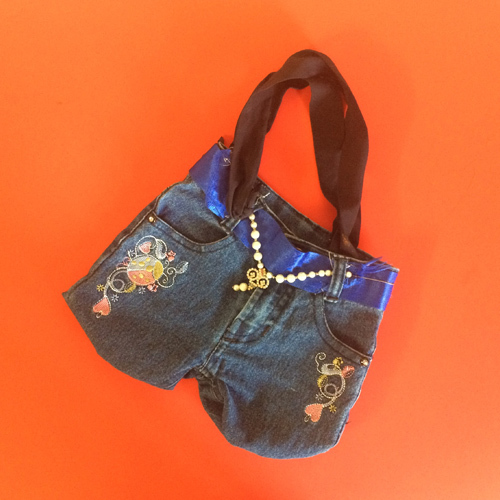 First, cut old kids’ jeans in an appropriate bag shape. The choice is yours; you can select a variety of shapes according to your creativity and imagination. After proper cutting, turn it and sew it properly. Add lace or yarn as a handle. Decorate it with beads or other decorating material. A super cool kid’s bag is ready. I am sure kids will love it. I had a collection of old tops which I rarely wear (because of size issue) and I love their design and pattern and even the fabric condition was very good. So I had thought, ‘Why not reconstruct them to make a girl’s dress?’ Take the proper measurement and cut the top accordingly. Then sew it. You may add a stylish belt and net sleeve for a gorgeous look. An amazing new girl’s dress is ready to wear. While doing all these recycling clothes project my kids got a little bored. Since most of them are sewing projects and they had nothing to do, so to entertain them at the end, I selected the simplest recycling project with an old pair of socks. 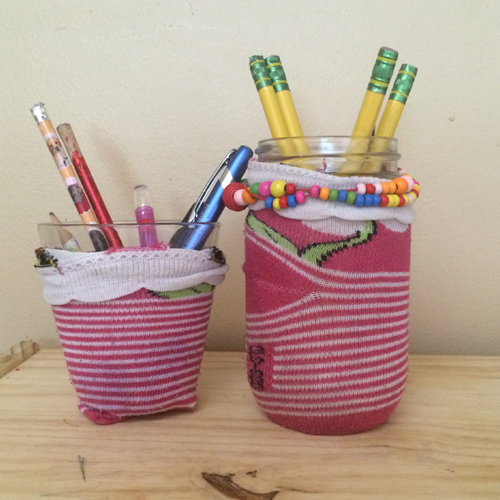 Take a mason jar and instruct the kids to put the old socks on the jar, carefully. It will be a perfect cover for the Mason jar and you can use it as a table organizer for a fancy look. Kids were happy that at last they got a chance to make something. They were showing their fancy table organizer to their friends with pride and happiness. So this was our collection of recycling cloth projects. Have you ever made a cloth recycling project? Please do share with us. Until then Happy crafting!